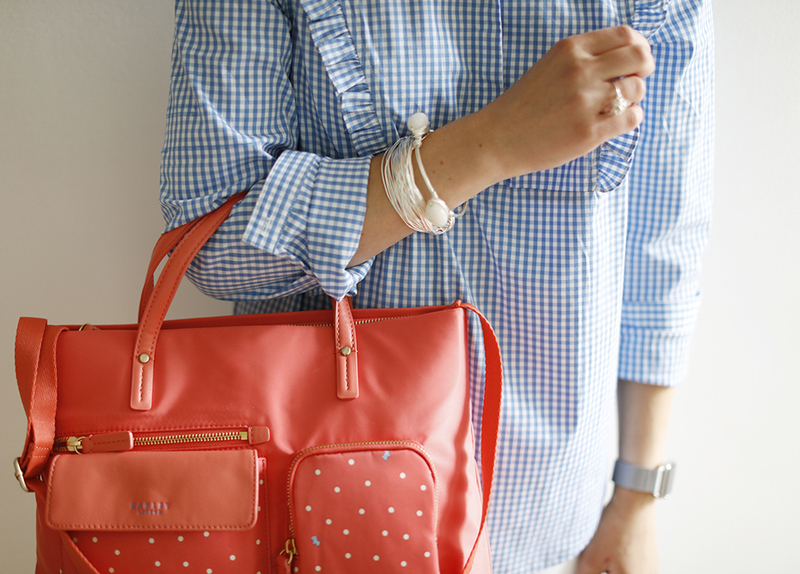 When it comes to quintessential summer style you can’t beat light blue gingham, white jeans and a peachy keen splash of coral and this outfit sums that up. I remember the excitement of putting on a brand new checked dress for the summer term at school with pure joy at breaking free from the restricting uniform of the colder months – I’ve never got over my shirt+skirt+sweater issues – but back to the 21st century! I took this crisp cotton shirt with bib front and ruffle detailing and kept it light with white denim and chalky grey shoes and (following my easy outfit formula) added colour with a bright tote. As a heels addict I shocked myself (and even my mum!) by picking up these Dune flatforms recently. I styled a client in them who was looking for everyday shoes for mum-ing in that weren’t ballet pumps or converse and they looked so great on her I couldn’t resist. Ticking the boxes for comfort and style, they’re also flattering on the foot which can be unusual for flatforms but thanks to the ever so slight wedge to the sole they satisfy my desire for a bit of lift. In a soft reptile finish they add texture while filling a neutral gap in any casual outfit. 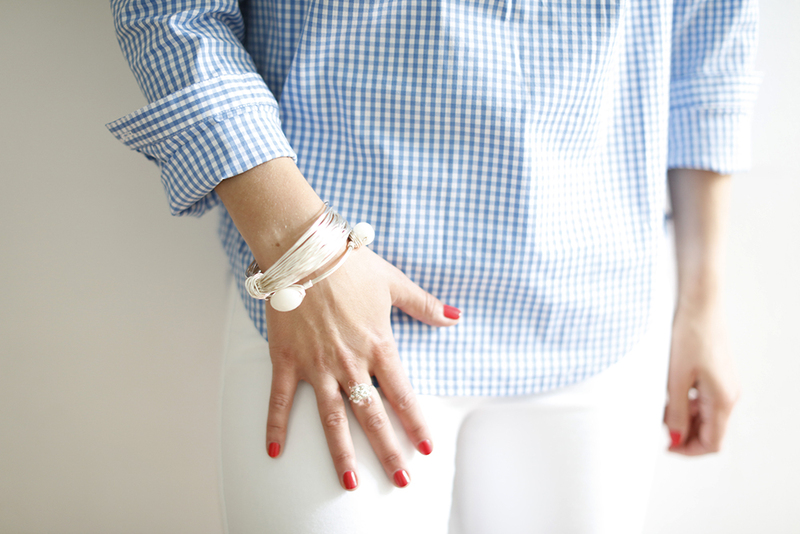 Gingham is another of those trends I suggested we watch back in summer 2015 (take a look here) in preparation for this summer – I’ve always loved a trend forecast! Oversized two-tone checks are big news (watch this space for an upcoming video on blown-out checks and how to wear them) but for this summer outfit the gingham stays true to its roots with the trend element of Ruffles and The Shirt. The bib front in blue gingham has a vintage look which suggests the shirt could be styled with a skirt for a retro feel but adding white denim brings it into the present day. Oh, and avoid teaming with plaits unless you want to rock a Little House on the Prairie vibe. Get the perfect sleeve roll à la J Crew with my 60 second style video here. Make the most of shorter sleeves in summer with stacked bangles in different thicknesses to finish an outfit and add polish. I kept it simple with silver on silver tones but mixing metals will update your jewellery style. For work to weekend and school runs in between, the bag with multiple pockets (including a dedicated tablet one – essential!) is every mama’s BFF in bag world. And one with multiple strap options for grab handles, elbow swinging, shoulder resting and hands-free cross-body wearing is an ever bigger hit. Throw in a bright colour to lift your neutral outfits and you’ve got your versatile arm candy sorted. An ideal travel bag, it would look fab alongside Radley’s navy spotted luggage; complementary without being matchy-matchy.